Coordinating dinner and taking photos is often a pretty tricky task as dinner time so often coincides with the two hours either side of sunset. In this case, it wasn’t such a problem. If you look closely at the pizzeria to the right you can see my family and English relatives at the large table under the left awning. 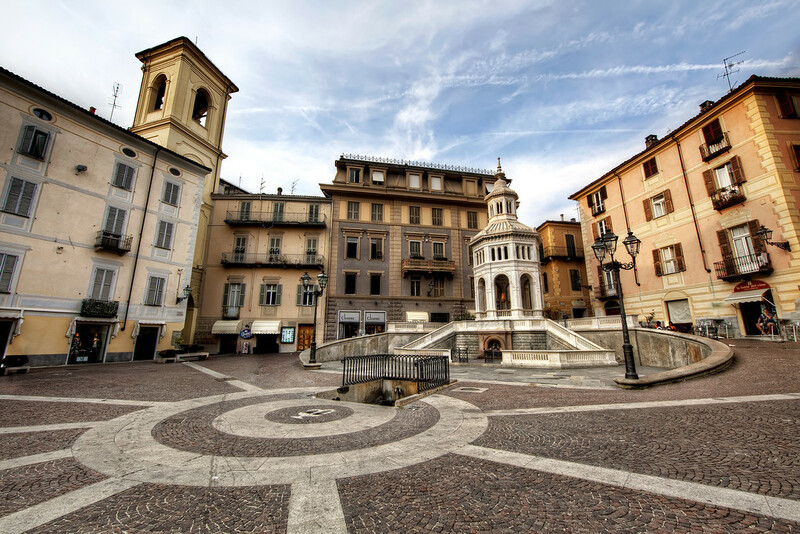 Acqui Terme is named for this spring in a very interesting, pretty square. When I got there it was totally overcast, except for a small patch of blue sky a long way away. I decided to wait for it. Time ticked away and I was thinking I may have to pack it in to go to dinner. 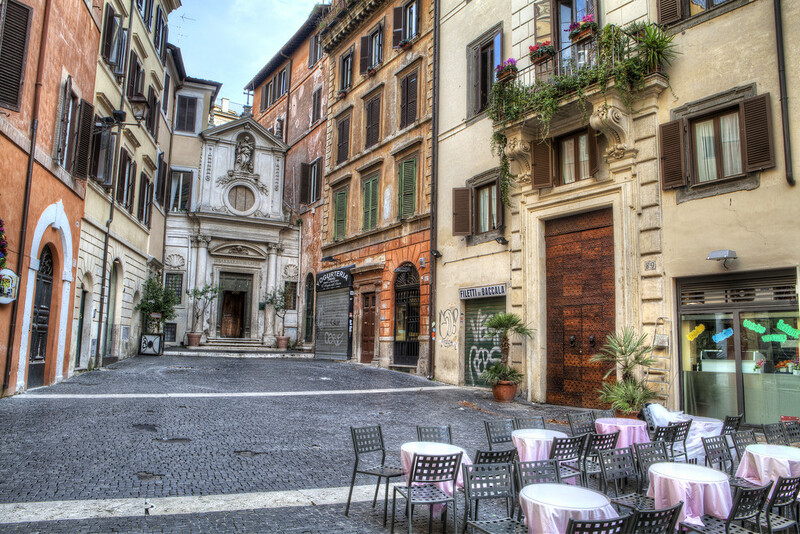 Fortunately, everyone decided to eat in the pizzeria in the same square. I stayed with my camera, waiting for the blue sky to appear where I wanted it. I was very hungry and wanted to order but didn’t want to pack up my camera to do it. Just as I was about to give in to the hunger, and pack up, my very conscientious travel partner appeared with menu in hand. I ordered a pizza diavola and continued waiting. Once my window of blue sky arrived I moved quickly through three points I’d previously decided to take photos from. This was the last of them. I arrived at the table just as my beer did… perfect! If you’ve been wondering when I’m going to add the next installment of my HDR tutorial I’ve got good news for you! It’s online now: HDR Tutorial 2. In this section I go through the Photomatix portion of producing an HDR image, where the three exposures are combined into one image. 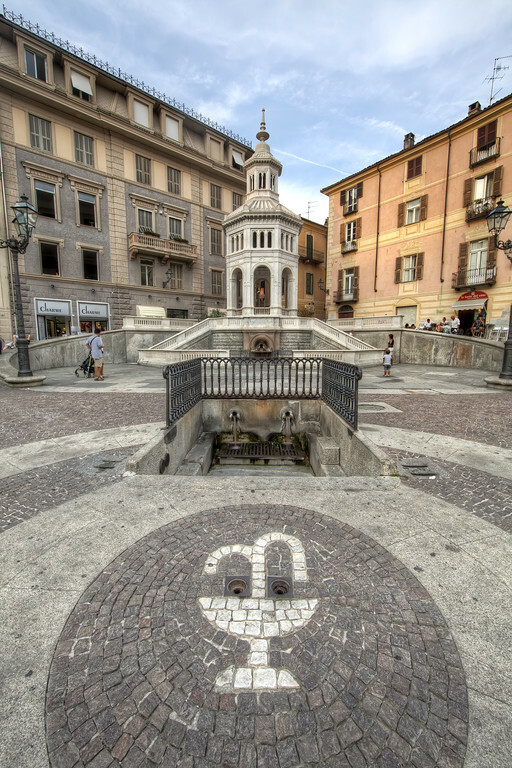 If you follow my site regularly you’ll probably recognize the spring in Acqui Terme. I spent a long time waiting for that patch of blue sky amongst the gloomy overcast sky to make it’s way into frame. Once it did I fired off a few shots from different angles. This one shows the detail of the cobbles in front of the spring. I’ve got all my new camera gear in! So tonight’s not a long post as I’m in the middle of playing with it all. It seems fitting that tonight’s photo be another of the few photos I took in Italy before having all of my stuff knicked! Robbed in Italy – No more Camera Gear! If you follow my website regularly you’re probably used to me missing an occasional post, but you’ve probably wondered what’s happened over the past week to stop me posting for days on end. 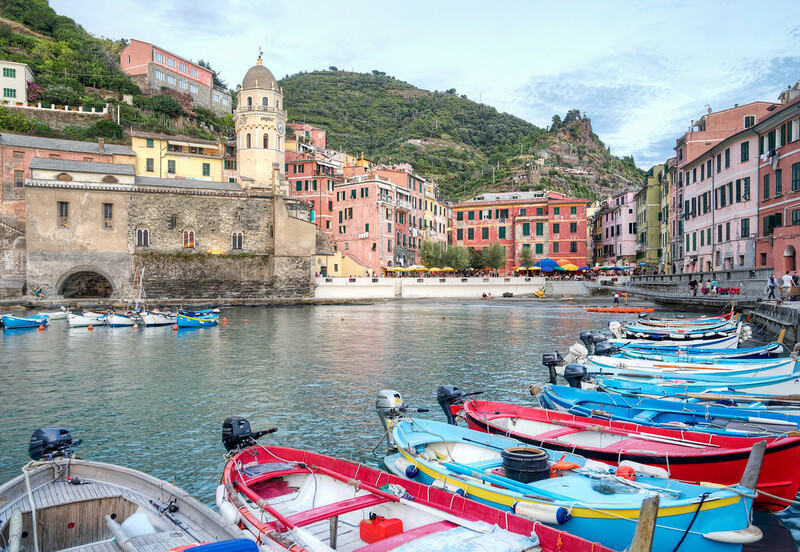 I was in a really good mood as I drove towards Portofino where I’d overnight before hopping on a train to get to the Cinque Terre just before sunrise. For the first time in Italy I had a plan that would definitely result in good pictures, rain or shine. I’d even used the Photographers Ephemeris to figure out where to position myself that evening for sunset in Portofino and where to run to from the train station in Riomaggiore. Then, I realised I should stop to get cash as I was running short and had a toll to pay shortly. So, I pulled off into a service station. I considered just fueling up and getting cash at the gas station. Then, I thought there may not be an ATM there so stopped outside the food place as I was sure there would be a cash-point there. Before I hopped out my girlfriend debated whether or not to get out of the car or stay and wait. In the end she came inside with me. As you’ve probably guessed, we returned to the car to find it had been rummaged through and pretty well cleaned out of every electronic good we had. My entire camera bag was gone, as was my girlfriend’s laptop, iPod, phone, kindle and, most worryingly, passport! 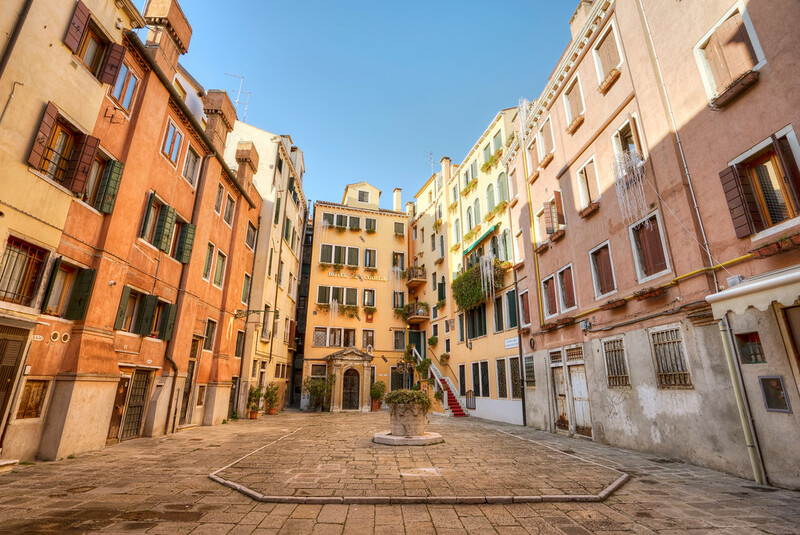 The passport was particularly annoying because it meant that rather than continuing on to join my family in Portofino we’d have to return to our hotel North of Genoa so we could get to the embassy in Milan the next day. My particular moment of terror was caused by the fact that I thought they’d gotten my laptop and, more importantly, my external hard drive with all of my unprocessed photos from Africa, Prague, Iceland, Bermuda and Italy. Fortunately, I’d been able to fit my laptop in the correct compartment in my carry on bag, which it doesn’t normally fit in. Somehow, this was the only zipper we had that wasn’t opened. I’m now looking into online backup solutions to avoid that feeling again. They’d also managed to damage my laptop screen in the process. Since then it has magically fixed itself. With the busted laptop screen, and being generally pissed off, I decided to give the site a break for a few days and just chill out round the pool. On a positive note, it seems when you see the worst of people it’s often closely accompanied by the best of people. After desperately looking around trying to find the bastardos (I learned that from the Italian cops) I realised I needed to call the police. I approached the first people I saw, two Italian ladies that didn’t speak a word of English, and managed to communicate to them what had happened and get the emergency number from them. It’s 112 for anyone interested. I quickly discovered that the person on the other end of the phone didn’t speak English so thrust my phone into one of the ladies’ hands. She told them what had happened and informed me the police were on their way, all in improvised sign language. They then proceeded to run around trying to find someone who spoke English. They found an older lady with her husband who spoke a bit. These four people waited with us for the police, and even called them again about 5 times, for well over an hour. The original two ladies kept hugging us while the older couple called us to the back of their car and fed us a load of fresh figs. They were delicious. There were a couple other particularly helpful people but I think I’ll continue this story another night. Long story short, I have no camera equipment, though it’s insured, so you’ll probably get to read about me agonizing over what to get with the insurance money. I’m also far short of the number of photos I had expected to get in Italy and a little concerned about how I’ll keep the daily photos going until my next substantial trip (likely not until 2013). 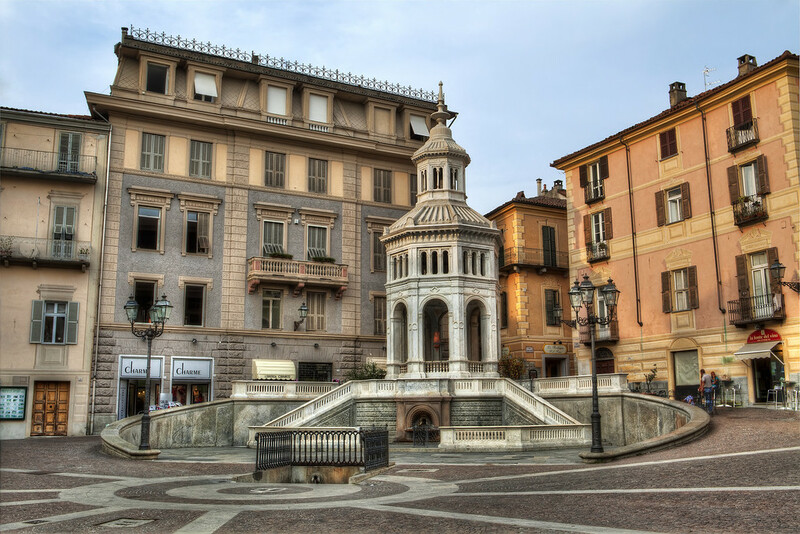 This elaborate fountain is actually a natural spring, the use of which dates back to Roman times. When you get up close to the flowing water a strong smell of sulfur singes your nose-hairs. I saw this and knew I needed to take a photo. I set up and fired off a load of shots even though I wasn’t happy with the white background provided by the overcast sky. 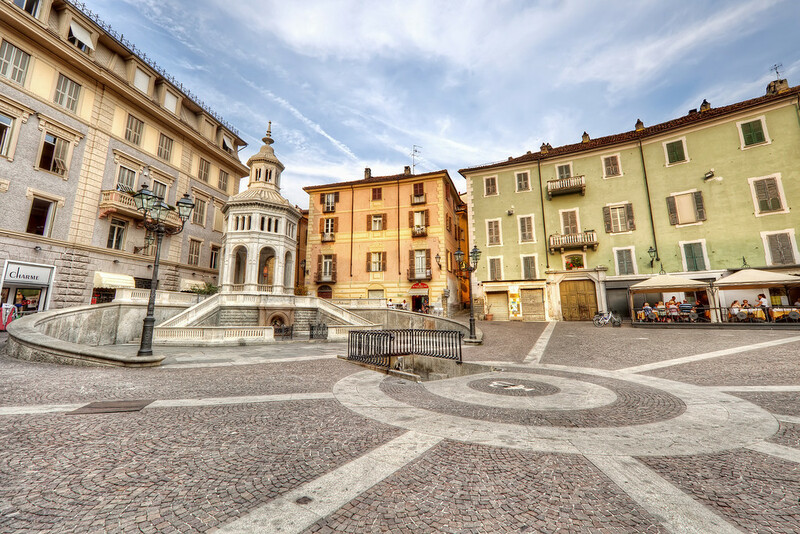 As my family arrived, as we’d agreed to meet for dinner at a pizzeria in this square I noticed that there was a gap in clouds approaching from the left. So, I waited. I waited so long that I had to have a menu brought across the square to me so I could order. On top of that, there were a lot of people walking about the square and it was too light for me to set a slow enough shutter speed to remove them. So, I shot 5 sets of bracketed photos with a break between each so I could mask out most of the people in the square. As it’s New Years Eve it make sense for today’s picture to be at the scene for one of the biggest New Years Eve parties in the world. I took this shot in summer, early in the morning. 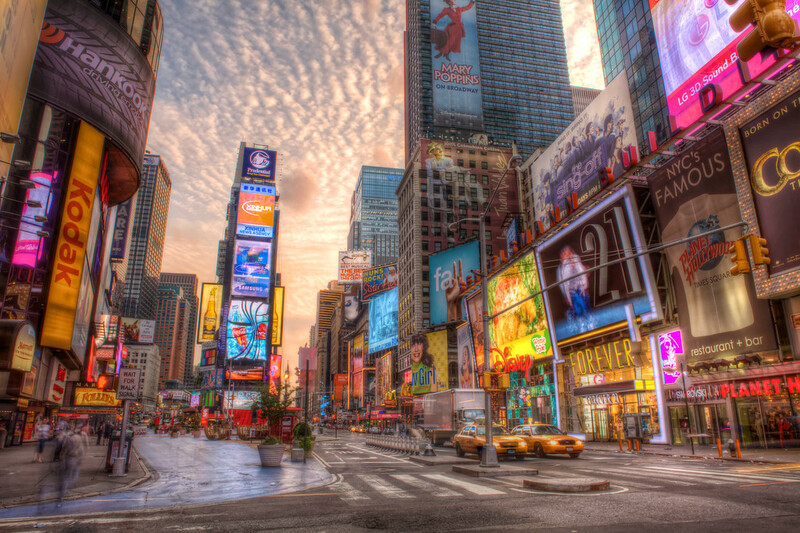 I’d been in Times Square the night before when it was full of people. It was weird being there when it was just me and the street sweepers. It was nice getting to take my time to set up for this shot without being jostled by the bustling crowd though. Feel free to let me know what you think of any of my photos by using the comment button below each image. Also, if you’d like to receive an e-mail notification of new posts you can subscribe to the right. If you’re interested in buying any prints you can do so by clicking the picture.